Serious music composed and/or played on your computer can still risk sounding squeaky, scrappy… just plain artificial. MIDI files can be all very well; but there’s a danger that every instrument sounds like a tin bassoon! Digital Audio Workstations (DAW’s) and notation software like Finale and Sibelius have made great progress towards realism in recent years. But they still need to reach into the real acoustic world in two long and deep ways in order to pass muster. First, they must have credible-sounding professionally-sampled virtual instruments (VI’s). But just as importantly, there must be a sense of acoustic space: reverberation, three-dimensionality, distance from (perceived) source – and, ideally, the very essence of a venue’s “personality”. Such sampling technologies are areas in which Vienna Symphonic Library (VSL) leads the field by a long way. The Austrian company of dedicated musicians and acoustic, technical and audio experts produces MIR Pro – recently upgraded to become, without doubt, the front-runner of a tiny clutch of similar products. By co-incidence, the MIR Pro range is also on sale for the whole of this month, April 2013. In fact, MIR Pro is the only product of its kind truly to add a sense of space, of a venue’s acoustic, of actually “being there”, to your music making. 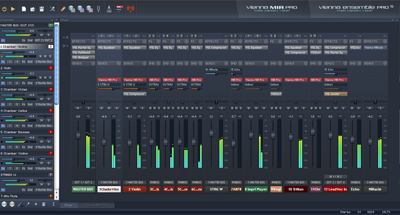 Vienna MIR Pro is meant to be used as mixing console, much as you would use an analog hardware mixer. Reverberation is achieved by a process known as “Convolution” working on and with so-called “impulse responses” (IR’s)… hence the product’s name, Multi Impulse Response. Convolution digitally “adds” the acoustic to your sampled Virtual Instruments (VI’s) allowing you to “position” sound on, around, across and from (virtual) stages. 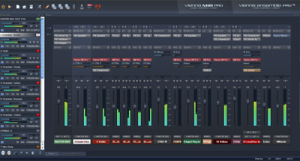 Yet MIR Pro is more than a dedicated add-on to control reverberation, convolution. It will run over a LAN when used in conjunction with Vienna Ensemble PRO 5. It compensates for latency (delay) and can be configured for almost any set of “environmental” (acoustic, location) circumstances. Configurations can be saved. MIR Pro counts as one of VSL’s “Software Products” as opposed to their “Instruments”. It’s a comprehensive, fully-integrated package which can be used either as a standalone (probably with a sequencer such as such as Digital Performer, Logic or Cubase) and/or as a plug-in (VST and AU) for the likes of Logic, Sibelius and Finale. In the latter case Vienna Ensemble Pro 5 (build 11660 and higher) isn’t necessary if you have software that uses the standard plug-in interfaces. In this environment you’ll simply see the MIR Pro plug-in listed in the appropriate place in that software with no further action needed on your part. 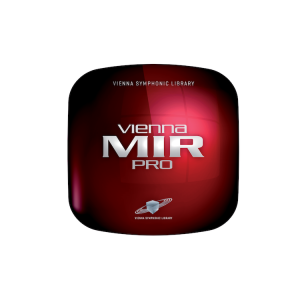 To get the best from MIR Pro and to experience the most seamless integration, though, Vienna Ensemble Pro 5 is recommended. Such seamless integration, unsurprisingly, is what was experienced during the current evaluation. From the early days of (digital) music production and recording, synthetic spatial information was all that was available to composers, musicians and technicians. Before that, physical plates and springs simulated analog reverberation. But they were either unrealistic, unconvincing, boxy or boomy. Or too perfect. 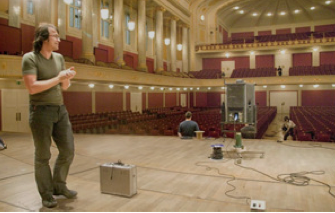 MIR Pro (now in its second major generation) takes a different approach, one ideally suited to serious or art music: it achieves as perfect a digital representation as possible of real acoustic venues – including their imperfections, local characteristics and “personalities”. MIR Pro uses sampled environments, then: a carefully defined signal whose properties are all both controllable and completely known is projected into the space in question through a loudspeaker. Then – fully under the control of the technicians – the space’s acoustic response (the IR’s) are collected, digitally recorded and – where necessary – post-processed. But the sampling process used by the Vienna technicians is multi-source, multi-directional, multi-positional, and multi-format. Hence MIR Pro. This can be a processor- and disk-intensive task. For true realism, it’s necessary to process hundreds (indeed thousands) of convolutions in near real time. To achieve this a method proprietary to the Vienna system is employed: “Positional IR Prerendering”. Just as important is the fact that an instrument sounds differently according to where you (the listener; and hence the microphone which brings you its sound) are situated. Think of listening to a trombone from ten yards behind it; now six inches in front of its bell. Space is three-dimensional. Clearly this information needs to be included in the production of the sound you’re working with in a DAW or notation software. In MIR Pro‘s case, the technology is called “Instrument Directivity Profiles”, the meaning of which is obvious. Strikingly realistic results were achieved during evaluation. RoomPack 4 is the most recent to be added. It has more than a total of 14,000 IRs from Hall One, Hall Two and the Northern Rock Foundation Hall at the The Sage Gateshead in northern England. Each one of has contains several thousand impulse responses. Each of these is expensive to rent for the lengthy and painstaking sampling process. The documentation that comes as PDFs with the product has illustrated and fascinating accounts of the method of collecting the samples in the several Locations included in the now four RoomPacks available for use with MIR Pro. What’s more, the beautifully-designed interface of the MIR Pro modules contains illustrations and (historical) detail and description as you choose each one. It should be pointed out that, although specific venues come with MIR Pro, the aim is not to mimic or reproduce them in the same way as providing a visual image would do – as desktop “wallpaper” or the background for a graphic design. Rather, VSL provides in MIR Pro a realism and authenticity of sonic environment that bring your music alive. From studio to large hall, church to auditorium, these are typical acoustics in which a variety of serous music is likely to be played anyway. 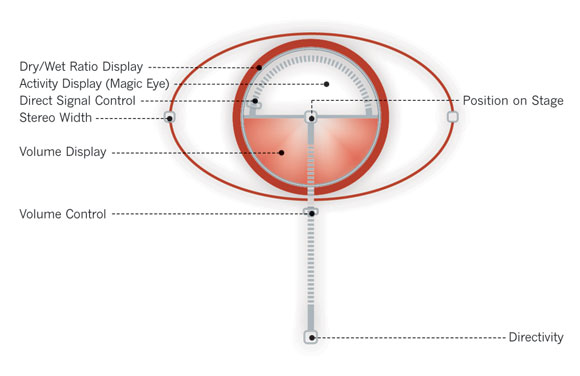 Four-channel ambisonics come into play too; but are beyond the scope of this review. As is the technical prowess employed by the folks at VSL to overcome the potentially crippling load on ever quite powerful computers of all this digital signal processing going on in real time with vast amounts of data. In fact IRs can’t be streamed – as instrument samples can. They have to be loaded into RAM… see the end of this review for system requirements. Just as important is the observation that it all worked flawlessly during testing, where RoomPacks 2 and 3 were used. The gear wheel inside the MIR Pro console spun at times; but sound never faltered. Not once. And the VI’s used for testing truly sounded as though they were being played actually in the venues and acoustics whose sonic characteristics were being added by MIR Pro. 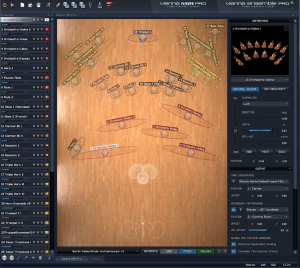 As stated, MIR Pro is an easy piece of software to use. While it’s true that its purpose is specific, it has many parameters which might appear bewildering at first. The main control which is placed on the Location’s floor plan alone allows you to slide or select Dry/Wet ratio (reverb), Stereo width, Volume, Directivity and Position on stage. The designers have done an excellent job, though, of exposing these ways of controlling the signal(s); and making sure that interactions and combinations are explained in the documentation, which, although tagged as “preliminary” does cover the ground well. 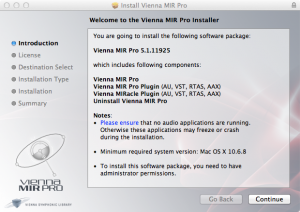 MIR Pro is installed using the standard OS X process. Both the standalone application and the plugins for DAWs and notation software such as Logic, Sibelius and Finale are handled automatically in this one operation. 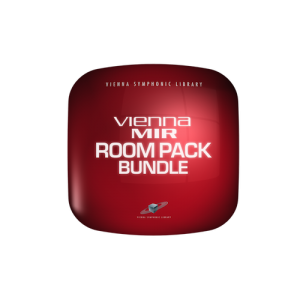 It’s necessary to install at least one of the four RoomPacks now all available separately before running MIR Pro. As noted earlier, there are four of these and none any longer comes bundled with the software. The RoomPacks are MIR Pro‘s data… they contain the huge collections of multi impulse response (M.I.R.) data gathered from the high-end musical venues which make MIRPro what it is. 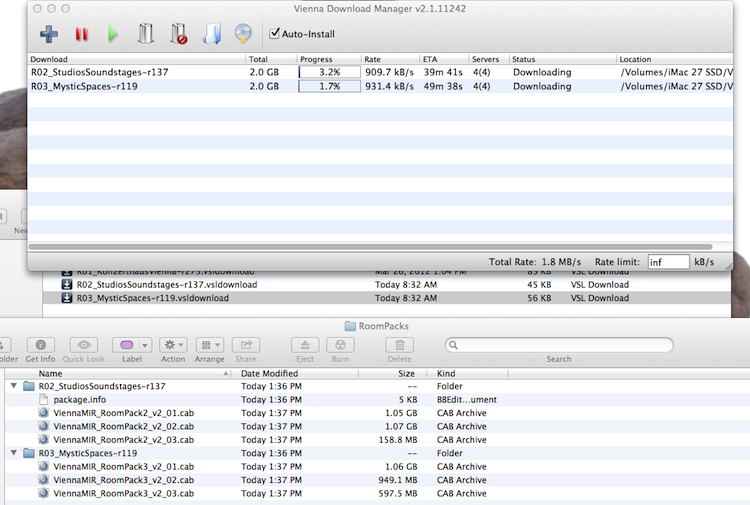 It’s easiest to do manage the RoomPack download and installation via the Vienna Download Manager. At 2 GB each, they’ll probably take 20 minutes or so on a fast broadband connection. VSL’s servers have been found to be generally fast and reliable. The Download Manager can either be set to perform the rest of the installation automatically on completion of the download; or to let you run it manually. In either case, clear instructions explain that you can then have this same process delete the resulting .cab files without affecting the data (itself in .vmi files). Very intuitive, this worked flawlessly during evaluation. If you decide to change the installation path to a custom location, you must point MIR Pro to that path – in its Preferences. 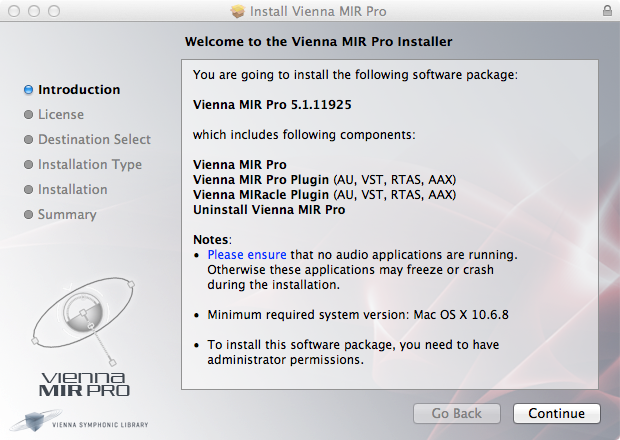 The default installation path is /Library/Application Support/VSL/Vienna MIR. After entering the Activation Code in the established way – using eLicenser – you’re ready to use MIR Pro. First you must align MIR Pro with each of the channels in your DAW or notation software etc by assigning them one at a time in the usual way for such devices. MIR Pro is, after all, a conventional plug-in as far as this aspect of its architecture is concerned. In the case of Vienna Ensemble, this is easy. Simply select it from the dropdown in the “Effects” menu of each channel; select your Location (that is, one of the acoustics in the RoomPacks you own); load it and start to use MIR Pro‘s representation of (conventional) sliders, pans, buttons, dropdowns and graphical controls to move around your room and effect the controls of your music as described. This kind of claim is often exaggerated… you dismiss those who wrote it as probably more familiar with the software and how to make it perform best than new users. In this case, though – thanks largely to the intuitive and beautifully-drawn interface – it truly is easy to obtain – and understand – excellent results very quickly. True realism in digital music comes from space, positioning, distances (in all three dimensions) between instruments; and space and distances between the group of instruments and the rest of the (usually finite) space in which they are performing. This includes the (type of) materials off and by which sound variously is reflected and absorbed. Crucially, realism comes from the many different ways in which all these interact. It’s only through the brain’s awareness of this physical space and these acoustic complexities that we can gain a plausible auditory image of the music we’re listening to. All of this is what MIR Pro allows you to control. The controls are highly intuitive, then. Handles move positions, vectors, angles, stretch distances and allow very precise positioning. Zooming and an awareness of hotspots and dead areas in a particular venue are all very intuitive. The interfaces of both the MIR Pro standalone “Control Icon” and those of the plug-in are a delight to use. They are beautifully (yet unfussilly) designed with sober colors that complement VSL’s signature navy blue palette. When it would be useful for workflow to be able to detach a control, pane or element, that can be achieved quickly… and just as easily reattached. Readout boxes, buttons, edit spaces and – particularly, given the focus on spatial graphics of the product – grab handles to move icons and representative elements such as microphones are all used. No more than a few minutes are necessary to become completely familiar with almost every one of MIR Pro‘s parameters – certainly the most often-needed ones. At a pinch the documentation will help out. Indeed, the manual goes into more than adequate and clearly-set out and explained detail about the myriad of parameters at your disposal. What’s more, the venue can be selected by its type, by reverb time and by location (which you’re likely to know anyway). On top of this, the characteristics and profile(s) of every instrument that you use can be further refined and fine-tuned by virtue of specific “Instrument Profiles” and “Character Presets” settings. Rooms can effectively be edited. 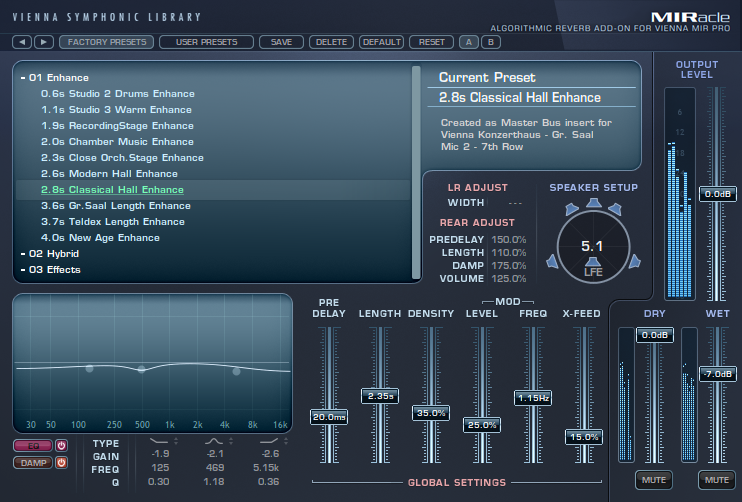 All your settings – fully and seamlessly integrated with Vienna Ensemble Pro – can be saved for later use as Presets. The presets supplied by VSL also make excellent starting points as hand-crafted configurations. 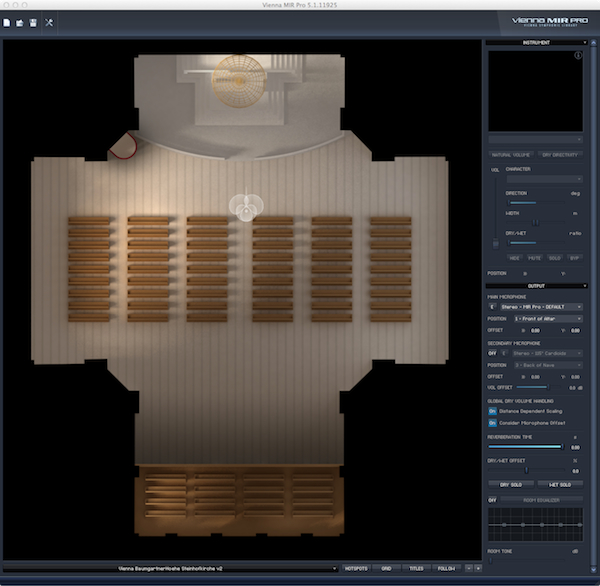 A major feature of MIR Pro is the selectable/togglable “Room Tone” where the pure ambiences of a Venue and its Locations have been sampled. Room Tone adds an extra sense that your music really is being played in that acoustic environment. 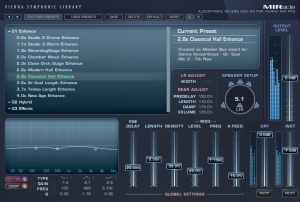 Unlike other EQ (frequency equalization) software, that employed by MIR Pro deliberately emulates the way in which analog EQ works – more realism yet again. Installing MIR Pro also installs MIRacle. This is a dedicated, purpose-built algorithmic reverb plug-in whose purpose is to afford yet more refinement of the MIRs. It, too, is now available in all industry standard plug-in formats… AU, VST, RTAS, AAX. What you end up with, then, is a feature-rich, flexible and easy-to-use set of full controls of the apparently-acoustic path, characteristics and environment which your music source takes as it heads for audio after composition or synthesis. Note that a wide variety of output formats is also possible. For example audio signals can be delivered in stereo, surround and on up to eight output channels. 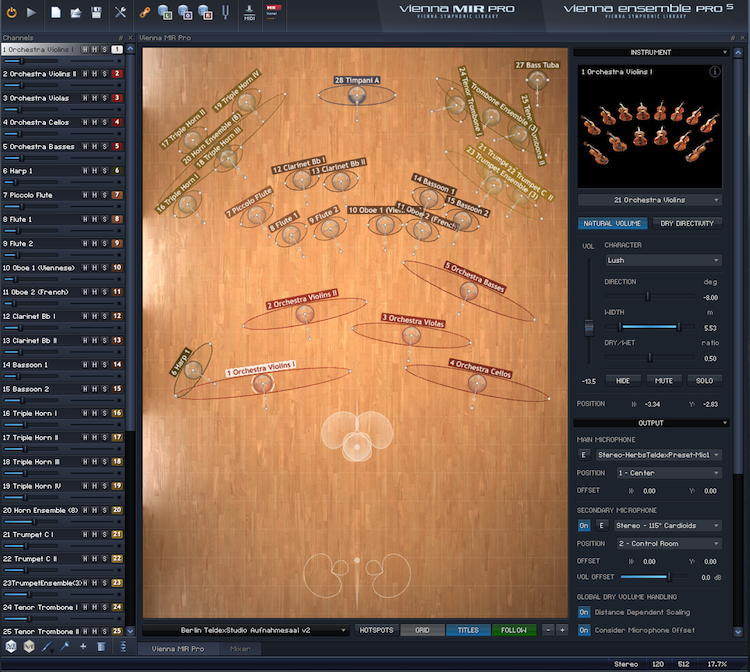 Add to this the many microphone configurations that are available to use and editing by the user the fact that instrument characteristics (from the Vienna Academy) are invoked by the unobtrusive little ‘i’ link in the instrument graphic window and you get yet more of a sense of just how powerful – and useful to a variety of musicians MIR Pro – is. Frankly, the dimension of realism that MIR Pro thus adds has to be heard to be believed. 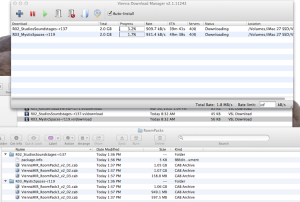 Listen to any one of the demo files on the VSL site and the single instrument previews here. Conclusion: Vienna Symphonic Library MIR Pro is the best product of its kind available. It can be safely recommended for its extremely high quality, reliability, flexibility and support in a wide variety of situations.